If marketers are aware of the benefits of influencers why should they keep up-to-date with influencer marketing statistics? The stats below tell a story about the way influencer marketing is being shaped by consumers. What works, what doesn’t work and what could be part of the evolving future of advertising. 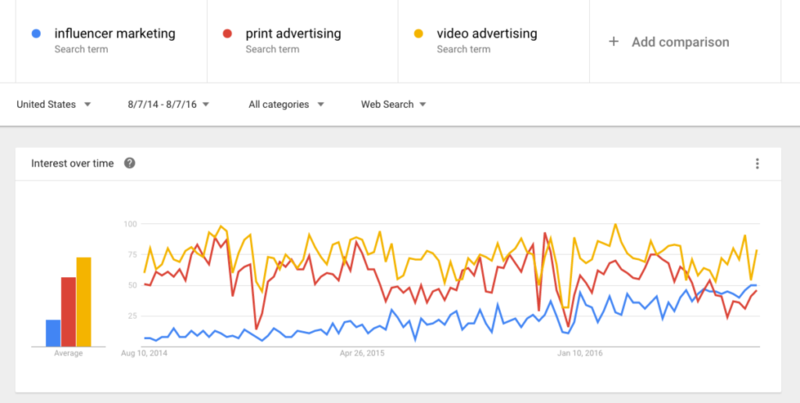 Over the past two years (2014-2016) Google Trends has shown the steady drop of print advertising. As we see in graph below, influencer marketing has steadily grown in popularity and looks to be closing the gap with video advertising. Influencer marketing plays a big part in both print and video advertising so the strategies are not mutually exclusive, but the trend speaks volumes to the success of influencer marketing strategies. The success of Instagram for influencer marketing is growing with new features built into the app. It’s extremely important to focus on long-term ROI from your marketing strategies. Micro-influencer campaigns have proven to be more successful than engaging celebrity influencers. The rise of Pinterest and Instagram have allowed consumers to get closer to the fashion industry with click-to-buy features. Influencer marketing is putting brands in front of a targeted audience with a trustworthy endorsement. The success of influencer marketing campaigns is being felt throughout the marketing world. If your brand is interested in learning more contact Acorn: The Influence Company. This number is expected to continue growing as consumers get more savvy about protecting themselves from ads. Their ineffectiveness on websites has been cemented by big companies (like Google) who have now removed side bar ads in favor of white space. Marketers are instead turning to influencers to generate authentic sponsored content. Do you want to know what an influencer marketing campaign for your brand would look like? Contact the Acorn team today to find out! Otherwise, keep up-to-date on the latest trends and news by subscribing to our weekly blog newsletter below!